Over 130 years ago, the U.S. was presented with the first playground, which was built in Boston. Since then, millions of kids enjoy playing on playground equipment every day. Playgrounds help promote physical and cognitive skill development — and, of course, are just fun to play on. But safety is always a concern when it comes to playground equipment. It’s important for school administrators to have safe playground equipment for schools in Texas. This article is going to delve into the importance of safety and inspection of playground equipment. While playgrounds are designed for children, there are quite a few aspects that can make them dangerous. Let’s look at a few common areas of playgrounds that can cause injuries. 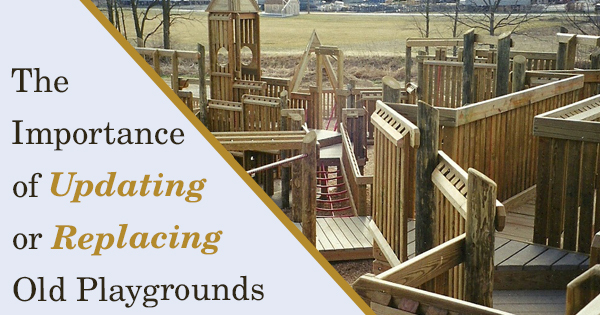 Surface issues: There are a lot of different surface options when it comes to commercial playground equipment. Unfortunately, kids can get really hurt if they fall onto hard surfaces. So if playground surfaces aren’t properly cushioned or are coming up and can be tripped on, this presents a serious danger to the kids playing in the area. Improper openings: One of the biggest hazards on playgrounds is openings that small children can fit their head, arms, or legs into. If they try to stick a limb through an opening, they could end up getting stuck and getting severely injured. So playgrounds should be designed with minimal openings for kids to put their limbs through. Wear and tear: General wear and tear on playground equipment, from age, use, and weather, can make playground equipment hazardous. Hardware can easily become rusted and come loose, which could mean trouble for young children playing on the equipment. If outdoor playground equipment is looking run down, it may promote injuries when kids are playing on it. When Should Playground Equipment Be Replaced? To ensure kids have access to safe playground equipment for schools in Texas, playground areas should be regularly inspected. Proper inspections should not only focus on just the playground equipment, but the area around the play equipment as well. Inspections should be done regularly to take note of any possible problems with the equipment. Generally, playground equipment should be replaced when the equipment can no longer function properly, wear and tear is extensive, pieces or parts of equipment are missing, or if a piece of equipment has become damaged. Overall, if a piece of playground equipment poses any risk of injury, it should be taken care of as soon as possible. Playgrounds should be a place where kids can be free and have fun — not a place where they need to worry about getting hurt. So always make sure playground areas are regularly inspected and that equipment gets replaced before it becomes dangerous. If you’re looking for safe playground equipment for schools in Texas, contact Playgrounds Etc to learn more about our playground equipment and financing opportunities.